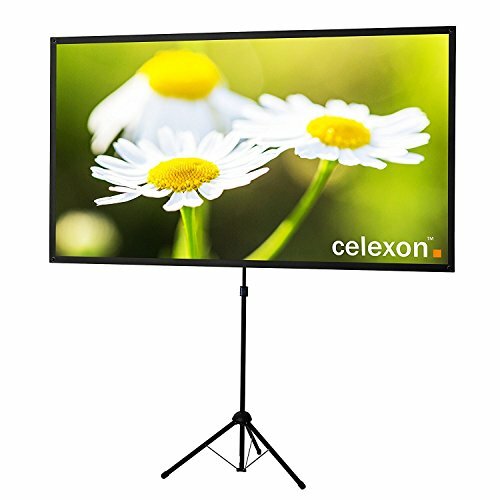 The Ultra Light-weight celexon tripod screen is designed for mobile applications. Whilst not in use it boasts a very small pack size and light carrying weight. Whenassembled, the robust tripod legs, fibreglass fabric and 1.0 Gain factor combine to create an optimum projection experience. The Ultra Light-weight tripod screen is height-adjustable. The fabric is supplied in a plastic sleeve and for extra protection, a robust protective shipping tube. The tripod legs fold away and fit comfortable with the screen fabric in the carry case provided. The pack dimensions are 45 x 8 x 5 inches with a weight of less than 11 lbs. Tripod foot radius: 15 "
This extremely lightweight and compact projector screen makes for the perfect mobile projection solution. Weighing less than 11 lbs with a carry case size of 45'' x 8'' x 5" (L x H x D) it is easily transportable and once assembled, boasts an incredible 80 inch matt white viewing area. The robust fibreglass fabric has a 1.0 gain at a 120° viewing angle and is M1 non-flammability class certified. The tripod legs and 4 rod spring tensioning system not only allow for a very quick assembly, (in under 3 minutes), but it also ensures that the fabric is held perfectly taut whilst in use to provide optimum viewing quality. This projector screen has a viewing area of 70'' x 39'', or 80'' diagonal. It has a 16:9 aspect ratio and is provided with a black carry case to protect it whilst being transported and stored. If you have any questions about this product by Celexon, contact us by completing and submitting the form below. If you are looking for a specif part number, please include it with your message.